When flooding gives way to the destruction of American coastal cities, when the increased droughts and decreases in annual water lead to fewer crops and greater hunger scares among the poorest, when the day comes that today’s warmest temperatures feel like cool breezes by comparison, and when the widespread political instability as a result of these changes gives way to chaos in the coming decades and next century, June 1, 2017, will be seen as a pivotal and disastrous day in world history. It is the day the president of the United States of America announced his decision to withdraw from the Paris climate accord. Nearly 200 nations signed onto the deal, which has the support of foreign leaders and American business executives. Yet none of that was enough for the man whose feelings about climate change have ranged from once pleading with former President Barack Obama to act on climate change to declaring climate change to be a hoax invented by the Chinese. In order to fulfill my solemn duty to protect America and its citizens, the United States will withdraw from the Paris climate accord but begin negotiations to re-enter either the Paris accord or an entirely new transaction under terms that are fair to the United States. We’re getting out. And we will start to renegotiate and we’ll see if there’s a better deal. If we can, great. If we can’t, that’s fine. The accord was negotiated poorly by the Obama administration and signed out of desperation. It front-loads costs on the American people to the detriment of our economy. The nations that remain in the Paris agreement will be the nations that reap the benefits in jobs and industries created. I believe the United States of America should be at the front of the pack. But even in the absence of American leadership; even as this administration joins a small handful of nations that reject the future, I’m confident that our states, cities and businesses will step up and do even more to lead the way, and help protect for future generations the one planet we’ve got. Those nations would include Syria and Nicaragua. Obama also touted the private sector to help spare us from what is a fool’s decision. “The private sector already chose a low-carbon future,” Obama said. The official withdrawal procedure is a lengthy process that will not end until November 2020. A lot can happen in four years, though, hence the growing concerns of not just environmentalists but anyone with some sense. This would include people like me who watched Captain Planet as a child. I would like to publicly apologize to Captain Planet and the Planeteers because each of them tried to warn us about the dangers of pollution and really dumb folks who don’t care about the preservation of the earth. I would also like to add Michael Jackson to the list, since he, too, tried to steer us in a more productive direction by way of “Earth Song.” Y’all’s lazy thot of a president knew Jackson. Has he never heard this song? Just because he’s husky-squared, slow and eats garbage all of the time doesn’t give him the right to treat our planet as poorly as he treats his body. Now that we’re done with the apologies, I’d like to wave one finger—sing with me now, “Work the middle, work the middle”—at every deplorable responsible for this moron’s being our president. A reality-TV huckster has the power to further place us all in peril because white people needed to feel good about being white. Speaking of “Make America great again,” 45’s decision further confirms the inconvenient truth that the United States of America is an empire on the fast track to decline. This comment was in reference to many things, including the expectation that 45 would keep his campaign pledge and pull the U.S. out of the Paris accord. This is exactly why Germany is becoming Beyoncé and America is an Instagram model in fashion nova jeans hawking flat-tummy tea. Sad! Of course, we cannot just blame the current president. In Media Matters’ latest annual study examining the broadcast networks’ coverage of the issue of climate change, researchers found that in 2016, none of the evening newscasts and none of the Sunday shows on ABC, CBS or NBC aired a single segment related to climate change or climate-related policies or issues—including the Paris agreement—during the Donald Trump or Hillary Clinton presidential campaign. We heard about her emails and we saw many of his rallies, but nothing related to the fate of the world in light of climate change. 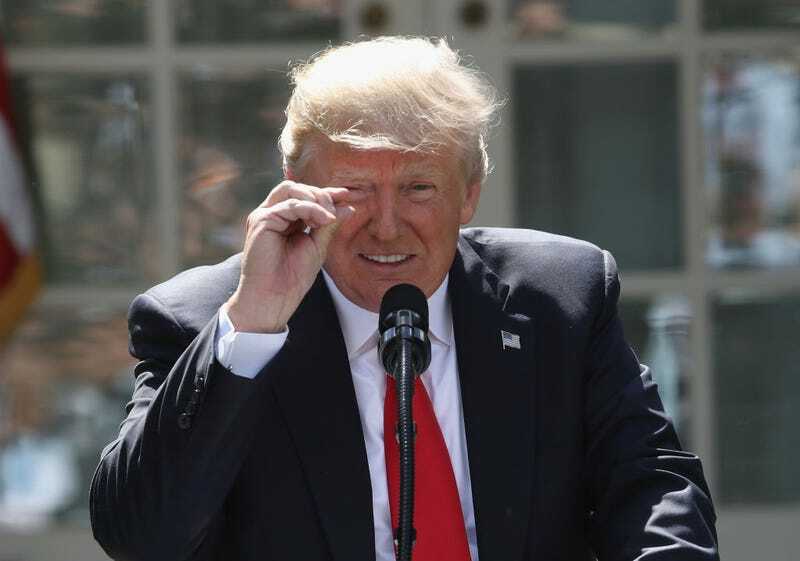 So thanks to a sensationalist press that helped give way to a nincompoop who can’t even own up to a typo, much less a lack of understanding about climate change, the United States has pulled out of the Paris accord, which dims our light on the world stage and contributes to our own collective suffering. Way to literally drown yourself, America.